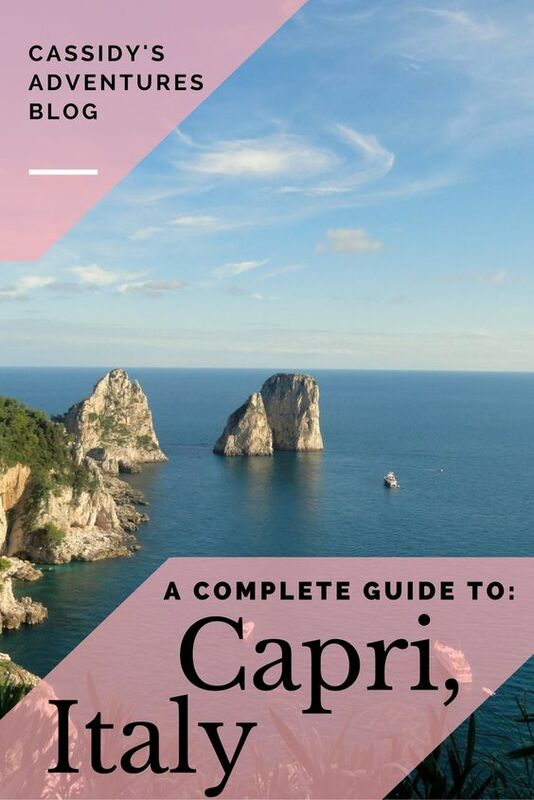 Capri is an island located in the Tyrrhenian Sea, just off the cost of Sorrento, in Campania, Italy. The island has been inhabited since the Roman empire, first being called the "goat island." Emperor Augustus, the first emperor of the Roman Empire, was the first to occupy the island, as proof by the villa of Augustus. It is said that he built temples and aqueducts and gardens here so that he could rule from his private paradise. After a particularly stressful week last September, I took off for a getaway with a few friends from my university. We awoke early one morning and, as planned, took a ferry from the port of Sorrento to the Marina Grande on island of Capri. What first struck me was that this island, while touristy, is still most definitely a fishing village. There were so many little boats bobbing in the water. After walking around for a few minutes, we boarded a boat and began a tour around the diameter of the island. This cost 17 euros per person. Much to my dismay, the tide was too high and we were unable to enter the famous Blue Grotto, a cave which radiates the blue color from the water to form magnificent blue light. I immediately began to plan my return. Halfway through the boat tour, the sun began to peek out from behind the clouds. Thirty minutes later, the clouds and fog all disappeared and the temperature warmed up quite nicely. As we passed under “Lover’s Arch" (these rocks protruding from the water are called I Faraglioni), our tour guide told us about the legend that says that if you kiss your lover under the arch, you two will be happily together forever. Afterwards, we booked it for the hills. I would have loved to experience the thrill of racing a Vespa up a hill, but my friends opted to walk. I would have also loved to have lounged around on the Bagni Tiberio beach, but it was a bit too chilly for my taste. The hike was, as typically works, harder than expected. About halfway though, I felt like giving up. My thighs were aching and my breath was faint. We came across this house, which caught my eye with the large fence along the path. Peeking past the fence, I spotted Snow White and the Seven Drarfs, as well as a few cats and many shy kittens. Just seeing the cats was enough of a refreshment to help me keep going. Regardless, when I finally reached the top, the view made me forget all about my tired legs. I had not forgotten that it was time for lunch though. Following the Rick Steves guidebook, we made our way through the maze of narrow alleyways and settled at a small restaurant, one of the only affordable places in Anacapri. I ordered a whole pizza, topped with cheese, mushrooms, and ham. I ate the whole pizza too. The warm puffy crust was irresistible​. It was overpriced, so I was going to get my money’s worth. Plus, I just wanted a whole pizza. ​Once we paid, we continued our journey. This meant a solo cable lift to the top of Monte Solaro, which is 1,932 feet above sea level. It cost ten euros. The ride to the top took about 15 minutes, which was a wonderful time to just sit, view the scenery, and relax my tired legs. It was also the perfect way to relieve the buildup of stress from earlier that week. I was in awe of the view at the top. It was so serene, so colorful, and so peaceful. There were flowers in every direction, and Roman statues decorating the corners of every post or building. The ocean stretches to the sky, and the horizon was merely a blur of the two. It felt like I was on top of the world. But, what goes up must come down. So we took the cable car back down. We walked around Anacapri for a few minutes, but soon realized it was so rich and high class. As a college student, I felt like I didn’t belong in a place where every store was a Dior, Louis Vuitton, Prada, Armani, or Gucci. So, we left. Along the way, we stumbled across a few unique souvenir stores. I am always weary of buying objects because I live out of a suitcase, so I bought some fresh Limoncello lemonade instead. Wow. It was strong, and there was not a single grain of sugar in the entire cup. Still, it was cold and refreshing. After I had enough, I threw away the cup and continued my walk. Soon, we stumbled across our desired destination! The Gardens of Augustus! They were actually established by German industrialist Friedrich Alfred Krupp in the early twentieth century. It wasn't until 1918 that the gardens became known by Agustus. Before they were the Krupp gardens. The garden was nice, although it had a personal “flower lifeguard” who, quite honestly, did a better job guarding those flowers than most guards do of actual human beings. I was quite intimidated to inch towards any flower. It was so beautiful! You will have to go back :) Thank you!